A dental bridge is a treatment used to replace a missing tooth. When you’re missing a tooth between two teeth, the dental bridge connects the adjacent teeth to a false tooth that fills the space of your missing tooth. Bridges can be made from different materials. Some are metal, some are a combination of metal and porcelain, and some are made of all porcelain or all zirconia. Not all bridges are made equally. A dentist should customize materials and bridge design based on individual goals for treatment. 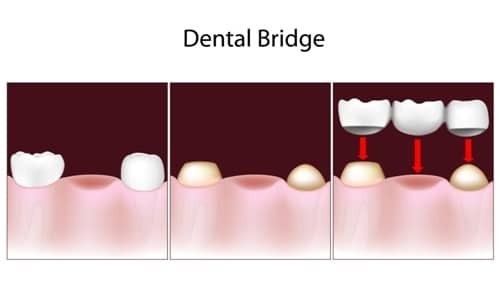 A bridge may be an ideal treatment option for you if you are missing a tooth and need to replace it. Some conditions that make a bridge the ideal treatment choice are: implant treatment is contraindicated; a bridge will offer significant improvement in aesthetics over an implant; the teeth next to the missing tooth already need crowns; among other conditions. Alternative treatments to bridges are available. The most common alternative is a dental implant. Whether you're a new or existing Intown patient, we'd be happy to meet with you soon to discuss your need for a dental bridge. To get started, schedule a LIMITED EXAM and SINGLE XRAY appointment with Dr. Susan Estep now through our interactive calendar.